Steelhead Alley Outfitters and our affiliated partners can be found all across the Lake Erie region from Erie, Pennsylvania to Ann Arbor, Michigan. If you are interested in spending a day or two chasing Smallmouth Bass on the fly, we have you covered! Below you will find a short description of all services offered from May thru September. 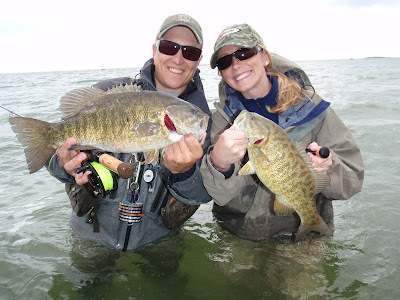 Starting in late April and early May, Smallmouth Bass start to migrate into the Lake Erie tributaries and around Presque Isle Bay near Erie Pennsylvania. They are moving in for a couple of months for the purpose of spawning. This means that incredible numbers of fish may be found in very small areas. Bass from three to five pounds can be caught on everything from topwater flies, large streamers, tube flies, and leeches. Over the past few year’s we have put forth a serious amount of time pursuing both resident and lake run Smallmouth on the fly with great success. 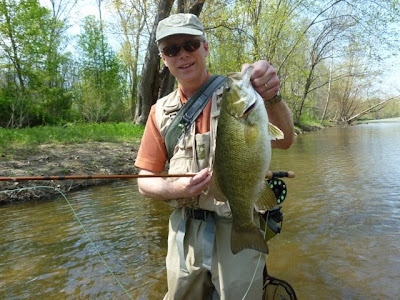 Fly fishing for Smallmouth Bass has become extremely popular for anglers around the region. As the run of Steelhead fades, the bass take over and the action can be as exciting as fly fishing gets on 5wt gear. If you are into warm weather (often times wet wading), sight fishing, and hard fighting fish this type of trip is for you! Float and wade trips are available May through June and include 8 hours with a professional, licensed fly fishing guide. All rods, reels, leaders, tippet, and flies are included (If clients wish to use their own gear that is fine) along with a stream side lunch. All that clients need to have is a valid fishing license, waders, and proper attire for the day. Half day trips are available. Please Contact us 1-888-453-5899 or team@steelheadalleyoutfitters.com for availability. Request a Smallmouth Bass trip by filling out this simple online form. The Huron River is located just minutes from Metro Detroit, and is truly a gem of a Smallmouth stream. Flowing 125 miles from its origin in Oakland County, Schultz Outfitters is the only full time guide service working the entire Huron River watershed. Accessibility is found easily in prime fly fishing locations. This designated blue ribbon Smallmouth stream fishes well from the last Saturday in April opener to late October. Although streamer patterns take the lion’s share of fish each year, other techniques have their time and place. Nymphing, large gaudy top water bugs, and dry flies are all used to take the bronzebacks that inhabit the pools, riffles, runs, and impoundments that make up this great river. Even though the river has gained popularity over the last 10 years we’ll help you find solitude between its banks. There are areas where you would swear you were up north, but you’re just minutes from home. The Huron River has something for everyone; whether it’s pitching streamers into cover, fishing big bugs in the dark, or taking advantage of wonderful dry fly fishing. You owe it to yourself to spend a day or two exploring the Huron. Float and wade trips are available May through September and include 8 hours with a professional, licensed fly fishing guide. All rods, reels, leaders, tippet, and flies are included (If clients wish to use their own gear that is fine) along with a stream side lunch. All that clients need to have is a valid fishing license, waders, and proper attire for the day. Half day trips are available. Please Contact us 1-888-453-5899 or team@steelheadalleyoutfitters.com for availability. Request a trip on the Huron River by filling out this simple online form.